Table Runners…dress ‘em up or dress ‘em down! 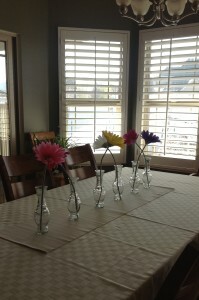 I love to decorate my dining room table with table runners. You know, those skinny almost too short table covers that look so neat on a dining room table or a countertop bar? 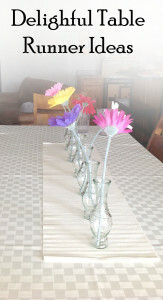 Table runners can be made out of ANY kind of fabric you like, from burlap to satin. I’m using a runner right now that is of minimalistic design. It’s one of my favorites. It’s a simple off-white, no design, runner and complements my dark table very well. One thing I really like to do with runners is use 3 or 4 and spread them cross-wise over the table giving the setting a striped appearance. Another idea is to place the runner down the center per usual and lay complimentary placemats cross-wise over the runner. This is a fun and CHEAP way to add a lot of punch to your table setting. 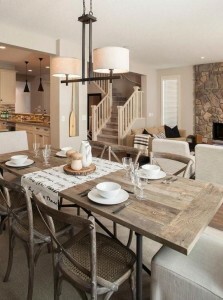 Using table runners while entertaining is a great idea. Even though I love pretty tablecloths I really don’t love how they catch on someone’s sweater as they pass by almost dumping dishes and glassware on the floor. 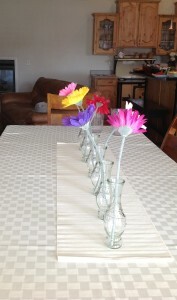 Below is a pic of my table using both a table cloth and runner. Simple, simple! When we got the dishes on the table it was so summery and fun. My daughter-in-law loved it. It was her birthday. The vases and flowers I picked up at a dollar store. Table runners can be layered, too. A larger longer one and a smaller skinnier one on top. Looks so fun. Think of how easy and inexpensive it would be to make one! Or a dozen! I love them. And an easy, easy way to decorate a holiday table. The left and right ones below are mine, but I loved the other runner idea, with it running the opposite direction. So much you can do!